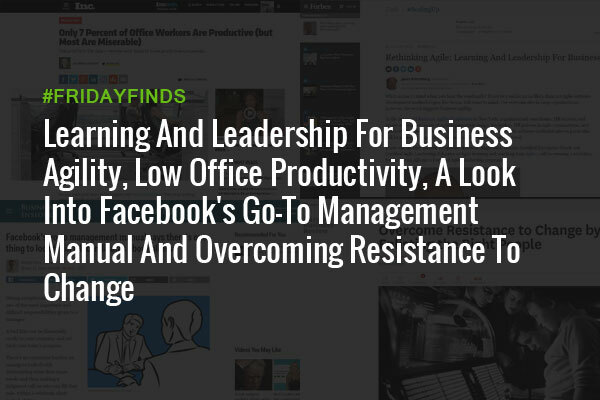 Welcome to a new edition of #FridayFinds, where we talk about some of this week’s best articles in HR and business. At the inaugural Business Agility Conference in New York, February 2017, organizational consultants, HR experts, and others will explore issues of agile organization design, leadership, HR policies in agile organizations, and business innovation. Angel Diaz-Maroto, Certified Enterprise Coach and Certified Agile Leadership Educator at Agile training and coaching firm Agilar, will also be running a workshop for the Scrum Alliance’s Certified Agile Leadership program. “Agile is now much more than a revolutionary approach to work for the software development industry. (…) It’s transforming a wide variety of industries and specialties from marketing and human resources to financial services. A recent FlexJobs survey of 3,100 professionals found that only seven percent reported they were most productive when working in the office. More than 50 percent of respondents said they accomplished more when working from home, while another eight percent cited better productivity at coffee shops, libraries, or co-working spaces. A growing body of research suggests that remote work helps people be more productive — upending the idea that teams must work together in person for the wheels to turn. More than 80 percent of survey respondents said they would be more loyal to employers if flexibility were an option. With PwC’s most recent Annual Global CEO Survey revealing that over 70 percent of CEOs identify the “availability of key skills” as one of the top three threats to their companies – an eight-year high for that question – recruiting top talent stands out as a particularly daunting challenge for HR practitioners. Also on the topic of “the right people”, Todd Warner argues that the secret to changing an organization is to understand the fundamental units that make up the social system — local tribes as he calls them— and to invert the change process so that tribes own the change. In his opinion, to influence tribes in organizations, you have to give up control, and recognize that every change always goes through a process of localization as it gets executed.